On the search for a festive treat to bring to that 4th of July Potluck? Well, search no further, this is exactly what you are looking for! These 4th of July Spritz Cookies are the perfect patriotic pot-luck pleaser. These delicious little butter cookies, resembling fireworks, can be made explosively festive (figuratively speaking, of course). Simply take the classic Spritz Cookie recipe and bump it up a notch with a little coloring and edible glitter. These spritz cookies will grab the attention of everyone strolling down that buffet table, and once they try them, they won’t last long! Besides the ingredients and equipment (Spritz Cookie Press) that you will need for the basic spritz cookie recipe (found in the link above), you will also need Disco Dust. Disco Dust is an edible form of glitter. It does not give your food any type of flavor, it simply makes it look more festive. Of course the Disco Dust is optional, but using it really gives these cookies the “wow” factor. The edible glitter can be found in most larger craft stores, any cake/candy supply store, or Amazon. Once your dough is made, divide it into 3 equal parts. Then, add red coloring to one section and blue to the other. For coloring your dough, you can use basic food coloring if you like. 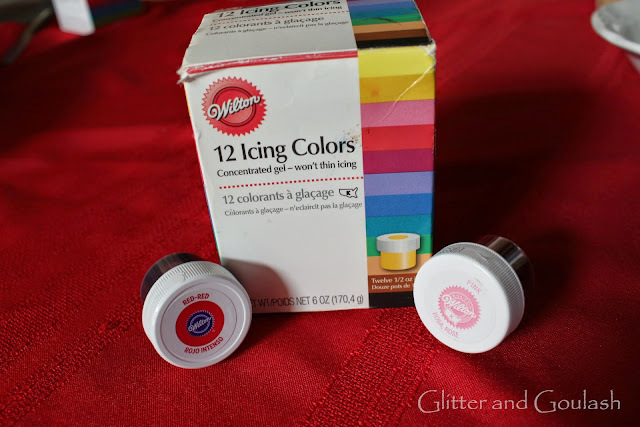 I prefer, however, to use Wilton Icing Colors. It is much more concentrated than regular food coloring so you will use much less and I think it gives you a much more vibrant end color. Now take small equal portions from each color and roll into little logs. These logs need to be about the length of your cookie press. You will have to simply eyeball the width of these to make sure that when you combine all three sections, that they will fit inside your press. Each color section of mine were approximately 3/4 of an inch wide. Then, take all three and lightly press together to make one round log. Place the tri-color dough into your cookie press. As far as choosing a disc for my cookies, I went with something less traditional then your typical star shape, I went with one that looks a little more like a flower (second from the bottom in this picture). I know that is an odd choice for a patriotic holiday, but I recently used this disc to make some spritz flowers for a wedding reception and the second I saw it in the baked version, I knew that with the right colors it would very much resemble a firework falling from the sky. So I decided to try it and they turned out awesome! Now it is time to press your dough out and bake your cookies. Once the cookies are done baking (leave them on the cookie sheet) add a light layer of your Disco Dust to the top of a cookie with a small decorating kitchen brush. The brush I use is actually just a regular paint brush that I only use in the kitchen for food decorating. Dip your brush in the dust and place in the middle of your cookie. Then, use your brush to fan the dust out to the rest of the cookie. Once you are done adding the dust, remove cookies to a cooling rack. I found that your finished design is a direct result of how the dough is placed into the press. Here are two slightly different ways and versions that I found, pick whichever cookie design you like the best and go with it. I put the tri-color dough into the press in a straight line. These cookies turned out with the three colors very defined and separate. I took the tri-color dough and twisted it slightly. These cookies turned out with the colors more mixed, almost like a tie dye effect. **These cookies do very well frozen. So make them ahead, freeze them, and pull them out the day of your gathering. Easy, peasy! Mix all ingredients together until it forms a smooth dough ~ DO NOT CHILL! 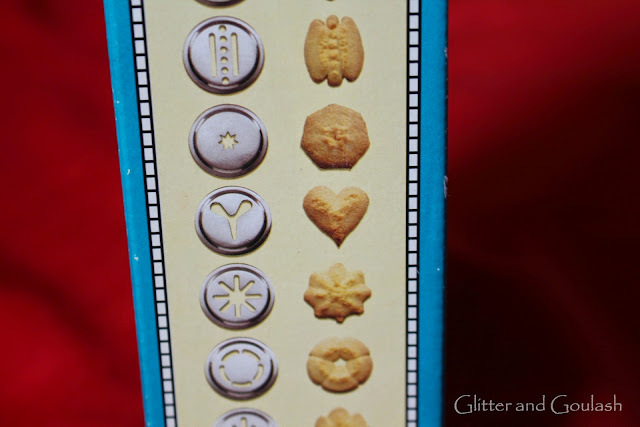 **You will need to have a cookie press to make these cookies. **These cookies freeze very well.